Can I celebrate Halloween in Zurich? Halloween isn’t a typical Swiss custom, but the scariest night gets more and more popular here every year, so don’t worry, you can! For Halloween, lovely café Miyuko (read more in post from September 27) – usually more a fairy-tale than a haunted castle – transforms into a ghostly place: At the Halloween Afternoon Tea author Christian von Auster will read spooky stories (in German), the pastries will match the vibe and visitors in disguise are more than welcome. The holiday of pumpkins and trick-or-threat will also be celebrated at Movie Bar and Oliver Twist Bar. 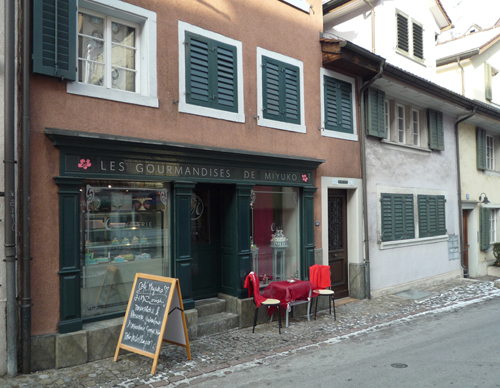 There is a good reason to leave downtown Zurich and walk up to a calm side street near Stampfenbachplatz: It’s Les Gourmandises de Miyuko. The lovely little café is situated in an old house and once inside, you’ll feel like in a Japanese fairy tale. From the menu to the furnishings and the large display of cakes and pastries – there are so many lovely details, you don’t know where to start exploring. Be sure to brunch there – the breakfast is lovely displayed and just scrumptious. Plus: Miyuko has a rich choice of vegan and glutenfree goods and also offers baking-classes.